Last night I had a couple friends over for some lighter board gaming. 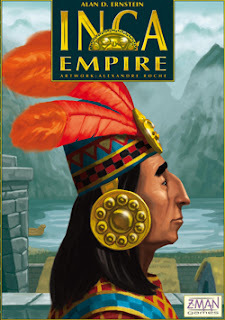 After a few games of Dominion and Carcassonne, I pulled out Inca Empire by Z-Man games. The game took us about 2 hours to play (none of us had played it before). The object is to accumulate the most points (mainly through the conquest of territories and construction of various things such as cities, garrisons and temples) before the arrival of Pizarro. The game is a reasonably unique one for the ones I've played. Players accumulate labourers and use them to do pretty much everything. Each player also has a small number of cards that can affect any of their actions. Overall it is a pretty light game. Last night I finished some pieces of terrain for my 15mm gaming. First up is 3 pieces made using a set of ruined building corners from Games Workshop. I didn't put any sort of flocking on besides sand and some gravel. I'm still humming and hawing about that. Overall I really like these pieces as they're good solid pieces of plastic. 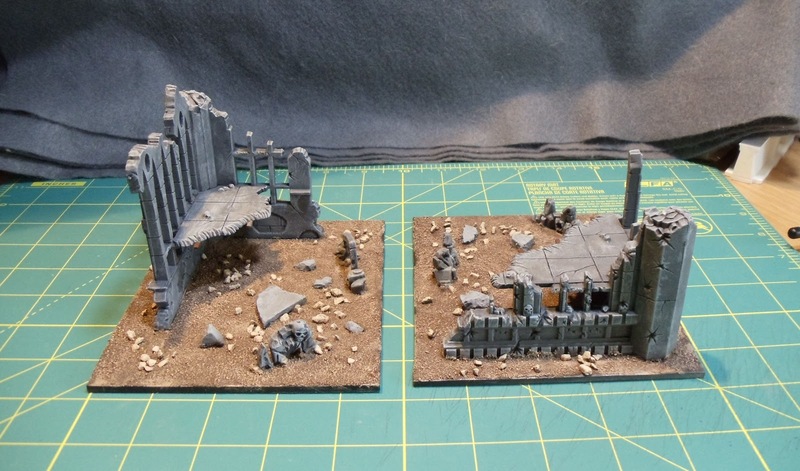 Unfortunately GW doesn't make these anymore so I've had to do some hunting on Ebay. Today I fortunately won another set. 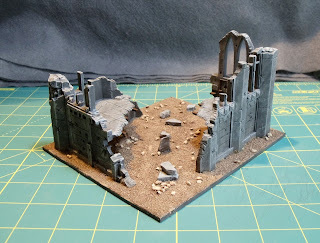 I could use a few more sets of these and I'd have a great ruined city table. 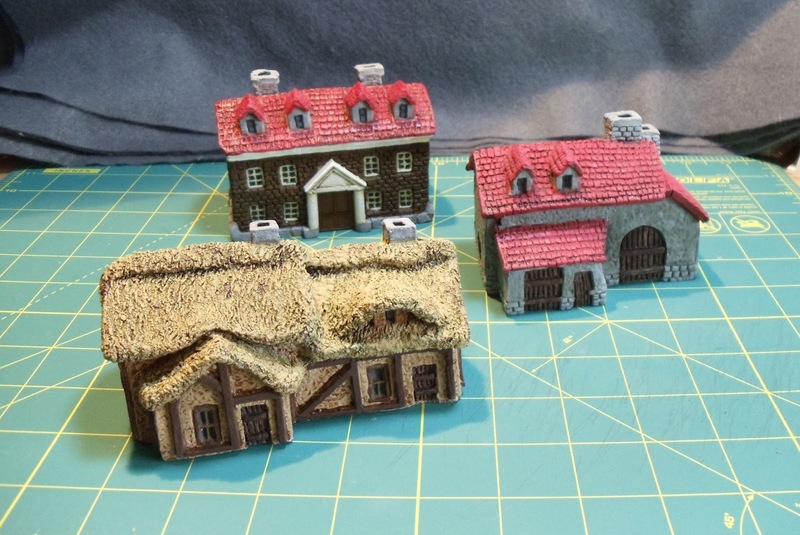 The other pieces I finished were 3 buildings from JR Miniatures World War 2 line. They're nothing flashy but perfectly serviceable. And they're heavy as hell. On my table right now is my unit of Plaguebearers which went by the wayside as I worked on the buildings. 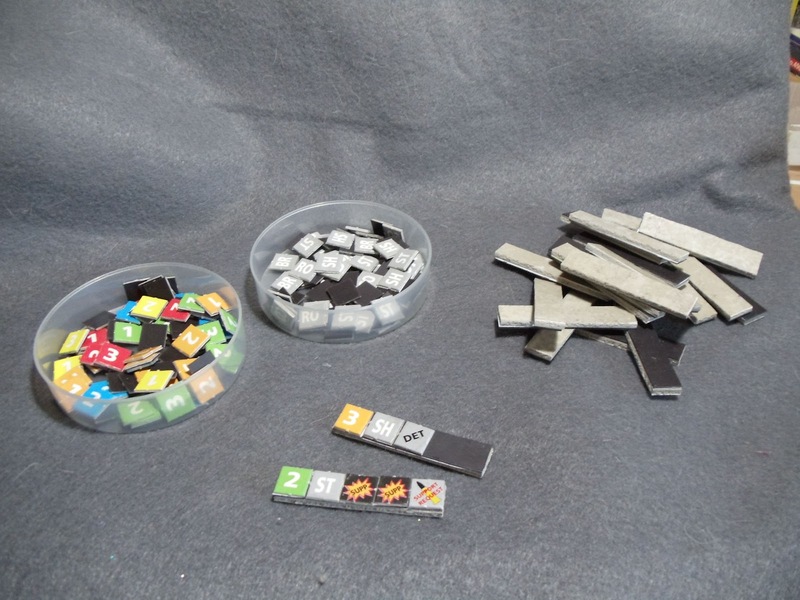 One of the common complaints about Stargrunt is the fact that the table may get covered in a wide array of chits. The vast majority of chits specifically apply to units. 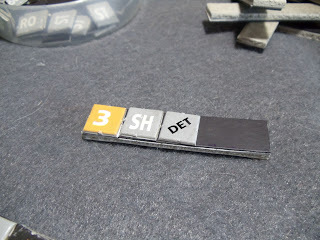 To this end I came up with an idea to have a small block with a magnetic strip to hold the chits. The block is floor tile with a magnetic strip on it. The chits also have a small magnetic strip on the back of them. The strength of the magnets is really weak and the chits can be shaken off by vigorous shaking. I was hoping the magnetic paper would be stronger but unfortunately it wasn't. Live and learn. Regardless it will really help keeping things uncluttered and it also makes it easier to pick the chits up. I played a game of Settlers of America on Friday. Pretty good game for a Euro. 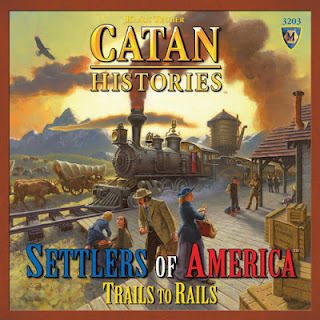 It's a lot longer than regular Settlers of Catan. It probably took us close to 2 hours to play. The game has the usual collection of nice wooden bits although the board itself could be a bit bigger. Once you get your cities and rails and trains all on the board it can be a bit cluttered. Last night Chris and I tried out a game of Stargrunt 2. Unfortunately I didn't get any pics. As we had never played before and our game was a decent size, it took us probably about 5 hours to play. Overall, I think this is the ruleset I want to use. Once we got going it became easier and easier. I didn't really find that the board got cluttered with tons of chits, which I think is a common complaint about these rules. I've got an idea to partially aid in keeping the board relatively tidy, I'll post up a pic once I create it. I can see how Tomorrow's War borrowed a lot from Stargrunt. Too bad they didn't borrow how to organize a ruleset. 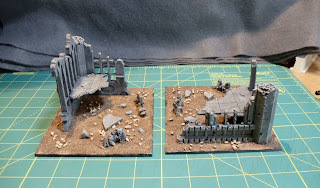 There are a couple wonky things in the rules, namely vehicle weapon ranges are crazy short, vehicles forbidden from certain terrain and the lack of reaction rules. Not sure about fixing reaction but the others are dead easy to change. Also a couple weeks ago, a couple friends and I went to Mecca, I mean the Sentry Box. Picked up a pile of 15mm Ancient Egyptians for when I start building my Impetus NKE army. I also picked up a couple pieces of terrain and two boardgames: Hellenes by GMT and Inca Empire by Z-Man Games. On my painting table is a pile of stuff: a unit of Nurgle Plaguebearers, a Nurgle character and a bunch of buildings (ruined and intact).